I knew that DS would have a long nap this afternoon because he’d woken this morning at 5.30am and had a morning at nursery to look forward to. I was right, he managed 3 hours, and in that time I was a busy little bee. 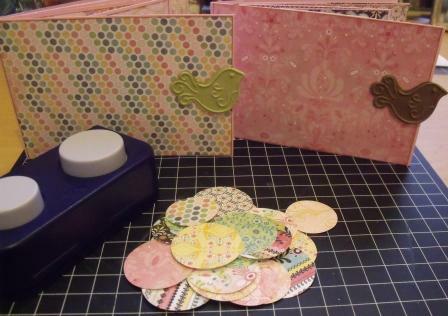 I made 2 more mini-books, pink themed and decorated with Basic Grey’s gorgeous Urban Prairie and Two Scoops. 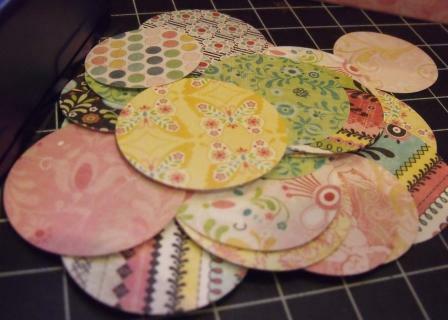 I also spent a happy 10 minutes punching circles out of the scraps. The fact that the ironing basket was neglected (actually, I down right ignored it!) is by-the by; I did find the time to change our bed and sweep the drive, again, of all the leaves and squashed fruit from next door’s fig tree. I can go to bed this evening knowing that I’m not a total failure as a housewife! Next Post A JBP Just For Me! I am exhausted just reading this!! wow you have been busy ! I've got a whole load of papers that need something doing with them but sewing/crocheting is getting in the way. I love the Urban Prairie range and used it during Cathy's Design your Life class. That looks lovely and son really needed the sleep. Lovely 🙂 I keep all my scraps too – many of them end up providing paper for punchies. Love these patterns!